Production of iron and steel is an energy intensive manufacturing process and needs natural resources (including the energy resource) in large amounts. Energy cost is one of the major costs in the operation of the steel plant. The energy efficiency and hence the energy consumption of the steel plant varies depending on production route, type of iron ore and coal used, the steel product mix, operation control technologies employed, and material efficiency of the plant. Conservation of energy is one of the most effective ways to improve the energy efficiency, to reduce the energy consumption, and to lower the costs with an added benefit of reducing the impact of the steel plant on the environment. In recent years, the need for a more rational and efficient use of energy has emerged as a strategic and urgent issue. The rational use of the energy resource is being regarded as a twofold issue, a first aspect being related to the achieved consciousness of the limited availability of energy, regarded as a source, and the second being represented by a mature appreciation of the costs incurred to procure energy. The cost of energy is not only the important motivation for the steel plant management to make efforts towards energy conservation and to increase the energy efficiency of the processes but the threat of energy shortages is leading the management to take steps for the conservation of the energy. Energy conservation also helps the steel plant towards its societal goal towards reduction of the generation of greenhouse gases. The composition and local conditions of each steel plant is different, and based on each unique situation the most favourable selection of energy conservation opportunities are required to be made to address to the specific conditions and design of the concerned steel plant. Today energy conservation in the steel plant plays a fundamental role. This approach to the processes of the steel plant helps the plant management to focus on to control activities and practices for the reduction of the energy wastes. Energy conservation not only has a positive effect on the energy efficiency, but it also implies a reduced use of energy sources, possibly integrated with the recovery of the waste energy. 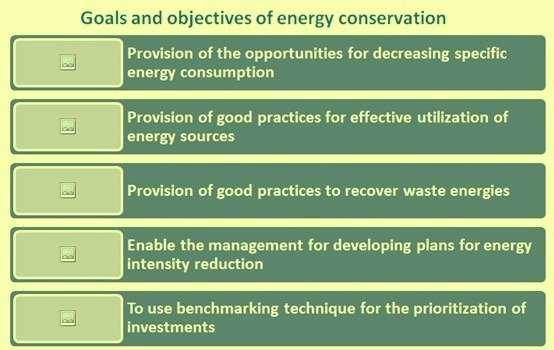 The goals and objectives of energy conservation activities in a steel plant (Fig 1) are as follows. Provision of the opportunities to decrease the specific energy consumption. Normally changes in the energy use in a steel plant are dependent on two factors as described by the following equation. Thus energy use in the steel plant is the product of the tons of steel produced (productivity) and the energy consumed per ton of steel. Energy conservation efforts are usually made to modify these two factors so that overall energy needs of the plant gets reduced. There are several approaches which are normally adopted for the conservation of energy. In the steel plant normally all these approaches are used in parallel for the purpose of maximizing the efforts on the energy conservations. These approaches are described below in short. System approach – Under this approach plant management develop systems to ensure that the plant processes are running in stable conditions and the equipments are kept in healthy condition by their systematic and timely maintenance. These actions result into optimized processes which in turn brings into large amount of energy savings. Monitoring approach – Under this approach, energy consumption at each point of consumption is closely monitored to ensure that it does not go off the norms for a long period. In case of notice of any deviation, corrective actions are taken to bring back the energy consumption within the norm. This approach adopts the real time monitoring of the energy consumption through a centralized energy centre. Energy balance approach – Under this approach, energy balance and other material balances (such as raw material balance, water balance, carbon balance etc.) at all the energy consuming points are carried out regularly for the control of the energy consumption. The balancing calculations generally bring out the discrepancies and the areas, where the actions are required for energy conservation, gets highlighted. Optimization approach for the generation and usage of byproduct fuels – Byproduct fuels constitute prominent energy source in a steel plant. A large part of the energy savings comes from improved recovery and more complete utilization of byproduct fuels. Maximization of their generation and their usage without any losses and flaring helps in the energy conservation efforts of the steel plant. Energy audit approach – Regular energy audits of the processes as well as the regions which are highly energy intensive helps the steel plant management to identify the areas where actions are needed for the conservation of energy. Waste energy recovery approach – Since most of the processes in a steel plant operate at a very high temperature, there is a big outgo of energy in the form of heated products, sensible and physical heat of hot exhaust gases, and heated water used for cooling etc. Recovery of this energy which is outgoing and recycling it back to the process is the basics for this approach. However it is neither practical nor feasible to recover entire outgoing energies but maximizing of the efforts in this direction helps the cause of the conservation of energy. Approach to select cost effective energy mix – Under this approach, steel plant management rationalize the energy mix by replacing the costly energies with cheaper energies, without affecting the energy efficiency and the productivity of the processes. Example of this approach are use of soft coking coals in the coking coal blend for carbonization in the coke oven batteries, use of pulverized non coking coal for injection in blast furnace to replace costly metallurgical coke etc. Energy management approach – Under this approach, steel plant develops procedures and system of recording and analyzing of the operating data. The employees are thoroughly trained in these procedures and system. By adopting this approach, there is normally a substantial reduction in the operating mistakes by the operators and the processes run in more stable mode, which in turn helps in the energy conservation. A sound energy management system creates a foundation for positive change and provides guidance for managing energy throughout the steel plant resulting into continuous improvements towards the conservation of energy. Energy conservation under energy management occurs because of existence of a strong organizational commitment. Energy management system helps to ensure that energy efficiency improvements do not just happen on a one-time basis, but rather are continuously identified and implemented. Automatic control approach – With the help of automation, human errors are eliminated. Also more instruments are installed and the data measured are more accurate without the interference of human elements. The data collected are immediately analyzed by the computers and the operator gets the analyzed data for the control of the process. This helps a lot in the efforts of the energy conservation. However this approach needs substantial investment. Approach of investment in energy conservation equipment and technologies – There are a large number of equipment and technologies which have been developed in the area of energy conservation in the steel industry. Some of these equipment and technologies need large investments while some other equipment and technologies need only minor investments. Most of these equipment and technologies are add-on energy conservation equipment and technologies which have very attractive and low pay back periods. Steel plant management must find funds to invest in these equipment and technologies on priority basis in their efforts towards energy conservation. Energy benchmarking approach – Energy benchmarking is the process of comparing the energy performance of the steel plant against its own performance over a time period or against the range of performance being achieved in the steel industry. Steel plant energy benchmarking is typically done on the basis of entire plant in order to capture the synergies of different technologies, operating practices, and conditions. Benchmarking enables steel plant management to set informed and competitive goals in the area of energy conservation. Benchmarking also helps steel plant management where to invest for improving the poorly performing systems while learning from the approaches used by top performing systems. Energy conservation activities need a good housekeeping and well qualified employees. For carrying out the energy conservation activities top management leadership and support is needed. Among general practices and technical changes which are required for energy conservation efforts include (i) management practices such as inspections to encourage conservation activity, (ii) training programs for operation of energy-intensive equipment, (iii) scheduling of energy-intensive activities, (iv) systematic maintenance practices, (iv) reduction and if possible total stoppage of idle running of equipment, (v) elimination of leakages and reduction of line losses, (vi) preparation of cost sheets where the energy cost is charged to the production department and not to the overheads, and (vii) participation of the employees towards the energy conservation efforts etc. These days automatic process control is the most preferred way of energy conservation in a steel plant. Under automatic process control, each stage of production in the steel plant is subject to sensing of physical parameters and on the basis of that information, making controlled adjustments. Some of the new developments involve on-line, or real-time, advanced process controls in which adjustments are made in processing the particular material sensed (feed forward controls). Advanced controls encompass mainly (i) sensing critical physical characteristics of the production, (ii) rapid analysis of those characteristics and determination of desired actions to modify the process(e.g. downstream from the point of measurement), and (iii) automatic implementation of some of these actions. At the same time, information is made conveniently available to the operators so they can make an informed judgment on the state of the process and intervene as appropriate. Electronic computation is just one part of this capability. The critical element is typically the sensors. With computer support more kinds of sensing are becoming effective. The actuators are also important. These devices must be accurate enough and respond rapidly enough to carry out the function. Energy conservation brings into many benefits to the steel plant. These include the following. Opportunities for energy conservation and their specific applications help energy managers to select areas for energy efficiency improvement. The measures that can be implemented at a steel plant largely depend on the specifications of the installed facilities, its energy management as well as its integration with upstream (e.g. production of primary steel) or downstream (e.g. forming of steel products) activities.